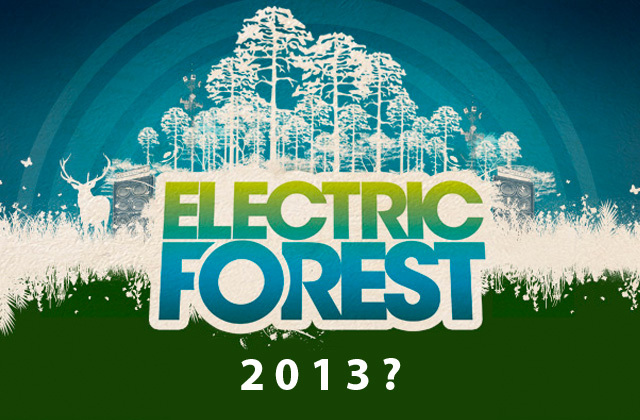 UPDATE (Jan. 11, 1:15 p.m.): Electric Forest has confirmed via Facebook that June 27-30 are the official dates. Read more. UPDATE (Jan. 7, 3:10 p.m.): William (Bill) Wagner of Grant Township has confirmed Electric Forest has indeed submitted a mass gathering permit request exclusively for the dates of June 27-30. The permit allows for a gathering of 10,000 or more people but does not specify any other expansion details. With official date and lineup announcements surfacing for nearly all of this year’s major summer music festivals, one is noticeably absent: Electric Forest. Earlier this year we received information from sources close to Madison House Presents — producers of the the Rothbury, Michigan event — leading us to believe Electric Forest would occur July 4-7, 2013. However, the Oceana’s Herald-Journal newspaper reported on Dec. 26 that Jeremy Stein of Electric Forest LLC in Boulder, Colo. has submitted an application to the Grant Township board for a mass gathering permit for the proposed dates of June 27-30, 2013. Electronic Midwest has so far been unable to obtain a copy of the application and our calls to the Rothbury city and Grant Township offices have not been returned. Madison House Publicity also declined to release any details regarding the 2013 event. The delay in an official announcement is concerning to some fans who are eagerly awaiting the third edition of the event. Official dates for the 2012 festival were announced the previous October, though dates for the 2011 festival weren’t revealed until February of that year. While Songkick is known to feature often unreliable information, one artist — RL Grime — has June 27, 2013 listed as an Electric Forest performance. We’re unable to verify the legitimacy of that listing. In October, the local White Lake Beacon newspaper reported that Madison House Presents was providing $40,000 to the Grant Township for road work near the festival site (Double JJ Resort), solidifying that plans for Electric Forest 2013 were indeed underway. Last year, Madison House gave $30,000 for similar improvements. 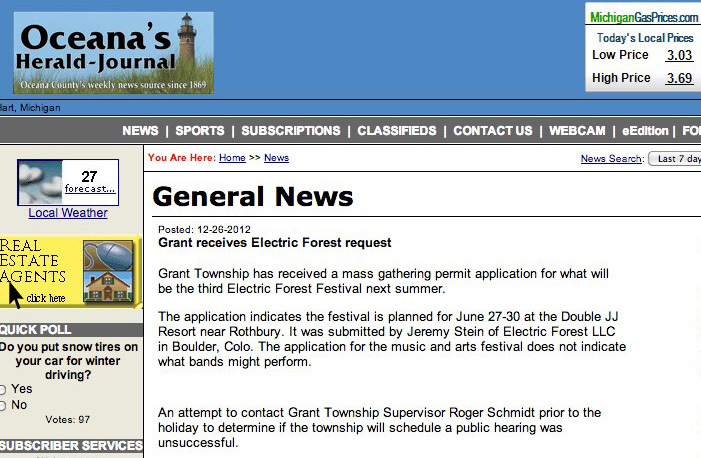 There have also been reports from those who have attended Grant Township’s board meetings that Electric Forest producers have requested to increase maximum capacity from 25,000 to 40,000 while also utilizing a much larger portion of available land at the Double JJ Resort. Double JJ Resort was also the site of Rothbury Festival, held in 2008 and 2009 before Electric Forest’s start in 2011. 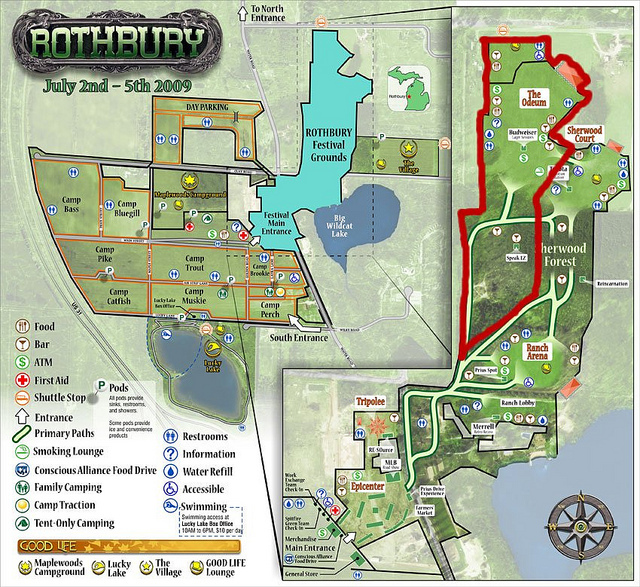 The map below depicts the ground covered by the 2009 Rothbury Festival. Areas outlined in red have not been utilized by Electric Forest but could be used during this year’s event. If the Rothbury layout was used, festival grounds would nearly double in size compared to prior years, leading to the possibility of additional stages. The Electric Forest Facebook and Twitter pages are occasionally updated with music-related posts, but they’ve made no recent hints that the festival is returning. Colorado-based Madison House Presents produces Electric Forest in collaboration with California’s Insomniac Events, the minds behind Electric Daisy Carnival and a number of other massive festivals around the U.S.
Electric Forest provides one of the most unique festivals in the country. In addition to an impressive musical lineup, the resort offers a variety of lodging options and amenities, the magical Sherwood Forest experience, a golf course, and even an on-site water park. The 2012 lineup included String Cheese Incident, Bassnectar, STS9, Thievery Corporation, Girl Talk, Steve Aoki, Santigold, Ghostland Observatory, Dada Life, Wolfgang Gartner, Richie Hawtin, Major Lazer, Big Gigantic, Zeds Dead and countless others. Next story Will the City of Miami shut down the second weekend of Ultra Music Festival? Photo Gallery: Something Wicked – Houston, Tex.